The whole body of law can be dividing into two parts: general law and special law. General Law consists of the general or the ordinary law of the land. Special law consists of the general or the ordinary of the land. Special law consists of certain other bodies of legal rules which are so special and exceptional in their nature, source or application that it is inconvenient to treated them as standing outside the general and ordinary law. 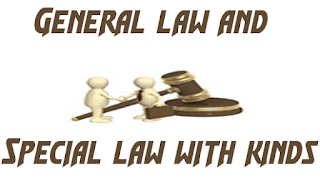 General Law consists of those legal rules which are taken judicial notice of by the courts whenever there is any occasion for their application. Special law consists of the legal rules which courts will not recognize and apply them as a matter of course but which must be specially proved and brought to the notice of the courts by the parties interested in their recognition. According to is meant the knowledge which any courts ex-officio, possesses and acts upon as contrasted with the knowledge which a court is bound to acquire on the strength of evidence produced for the purpose. For example, the court is presumed and bound to take judicial notice of the fact that there is monarchy is England and a republic in Pakistan. Salmond refers to six kinds of special laws and those are Local Law, Foreign Law, Conventional Law, Autonomic law and International Law as administered in Prize Courts. It means law which applies to a particular locality. It may be local customary law having its orign in immemorial customs prevailing in that locality or local enacted law, proceeding from local legislative authorities such a country Councils, Borough Councils, Municipalities etc. In addition to local customary law, there may be local enacted law which consists of enactment emanating from subordinate local legislating authority. They are recognized as having full force in the locality for which they have been formulated. It is essential in many cases to take account of a system of foreign law and to determine the rights and liabilities of the parties on that basis. Ignorance of law is no excuse and everyone is supposed to know the law of the land. Conventional Law has its source in the agreement of those who are subject to it. Agreement is law for those who make it. Examples of conventional law are the rules of a club or cooperative society. Some other examples of conventional law are the articles of association of a company, articles of partnership etc. By autonomic law is meant that species of law which has its source in various forms of subordinate legislative authority possessed by private person and bodies of persons. A railway company make bye laws for regulating its traffic. International Law is a kind of conventional law. As a special law, it refers to that portion of the law which regulates the practice of the capture of ships and cargoes at sea in times of war. International law requires that all states desiring to exercise the right of capture must establish and maintain within their territories what are known as Prize Courts.